Large ceiling light in a traditional style complete with shades. A rich bronze metal colour and ivory (off white) pleated shade. A stately elegant look perfect for lounge, dining room, hall, study or library -if you are lucky enough to have one! In fact anywhere with a high ceiling this light is sure to look wonderful. 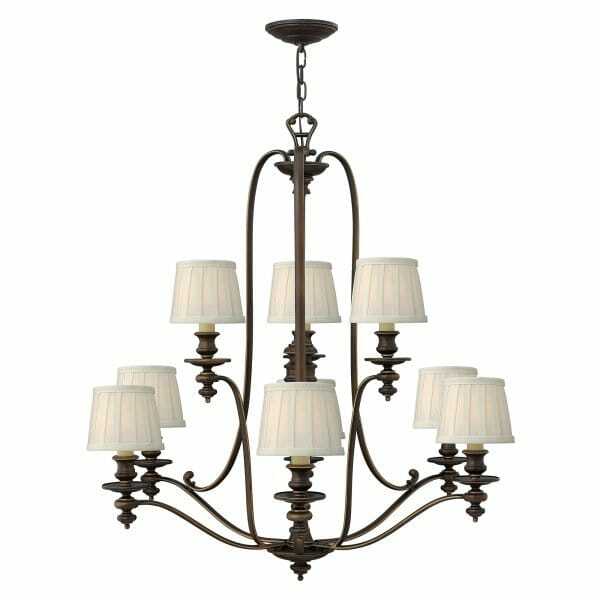 The sturdy solid central column swopping metal frame along with detailed candle sconces and antiqued faux candle sleeve really adds to the authentic stately home character of this light.